Sales of tablet devices, driven by Apple's iPad, will climb to more than 19 million units worldwide this year, most in the United States, according to IT research and market analysis firm Gartner. That figure will grow to more than 200 million units in 2014. Beyond tablets, Gartner has also updated its forecast for overall worldwide enterprise IT spending, saying the volume of spending will hit $2.4 trillion by the end of the year. In 2010, Gartner said in a recent report, media tablet sales will hit 19.5 million units and will then grow 181 percent to reach 54.8 million units in 2011. (Media tablets are defined as slate devices that run low-overhead operating systems, such as Apple's iOS (found in the iPhone, iPod touch, and iPad) and Google Android (found in a wide range of devices, inclduing slates and smart phones), among others. Some of that growth, Gartner said, will come at the expense of other low-end devices, including netbooks, as well as other handhelds whose functionality is incorporated into media tablets. "The all-in-one nature of media tablets will result in the cannibalization of other consumer electronics devices such as e-readers, gaming devices, and media players," said Carolina Milanesi, research vice president at Gartner, in a written statement. "Mini notebooks will suffer from the strongest cannibalization threat as media tablet average selling prices (ASPs) drop below $300 over the next two years." In 2010, North America will account for 61 percent of all media tablet sales, a share that will shrink to 43 percent by 2014, when overall units will hit 208 million. Gartner said education is playing a factor in the forecast, but the firm has not broken out the forecast by individual sector. 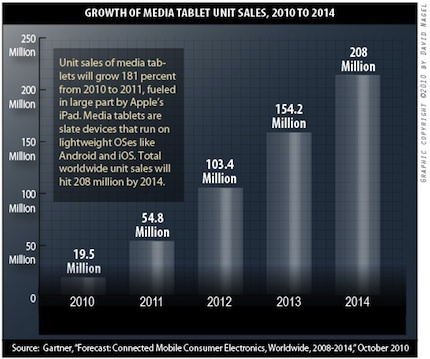 According to Gartner, media tablets are currently being relegated to a role as "companion" devices. "In the enterprise space, for the immediate future, the main use of media tablets is as a notebook companion or as a secondary device to take on the road or use for fast access to e-mail, calendaring, interrogating Web applications and information sources, and showing PowerPoint presentations," Gartner's report said. That will change over time, however, as costs decrease. And, the firm said, "As media tablets move from early adopters to mainstream, media tablets will become a family purchase as well as a personal one. The touch user interface, the applications available on the different operating systems and the simpler set up compared to a full-fledged computer make media tablets ideal for a range of consumers: from power users to techno-phobics. As costs decrease, media tablets will be added to the list of the devices lying around the house that are shared by the family." Further information is available in Gartner's complete report, "Forecast: Connected Mobile Consumer Electronics, Worldwide, 2008-2014." Gartner also recently updated its overall enterprise IT spending forecast for the next five years. According to the firm, overall spending across all sectors will finish at $2.4 trillion by the end of 2010. That will grow $100 billion in 2011 and will, by 2014, reach $2.8 trillion. Cloud computing, Gartner said, will have such a profound impact on IT that it will make "the impact of the Internet on the music industry look like a minor bleep," said Peter Sondergaard, senior vice president and global head of research at Gartner. The business impact of social computing: The underlying culture of social networking will, Gartner said, permeate the enterprise and "blur the boundaries between personal and professional activities." Context-aware computing will allow for "software and services that will blend data, text, graphics, audio and video with context such location, language, desires, feelings. Services not imagined today will use people's location--whether physical or virtual--as the foundation and then use data that determine your patterns of behavior, your desires," Sondergaard said. "Context Aware Computing while linear in its impact on IT will have profound impact on organizations, on the way we do business." The fourth broad trend that will emerge, Gartner said, is pattern-based strategy, which involves using predictive analytic tools to "seek out patterns amidst the burgeoning information sources and model future possibilities." Gartner presented these forecasts at its annual Gartner Symposium/ITxpo. Portions of the presentations can be viewed on Gartner's YouTube channel here.